Size Height 308 mm, width 210 mm. Watermark Two watermarks. Crown, form 1. Thin crossbow. Drake's identification: Watermark type 15. Drake's description: Thick crossbow 34 X 35mm. Date of earliest letter with this watermark is May 1608. Comments The folio is part of a larger sheet of paper combining the folios 140 and 141 . 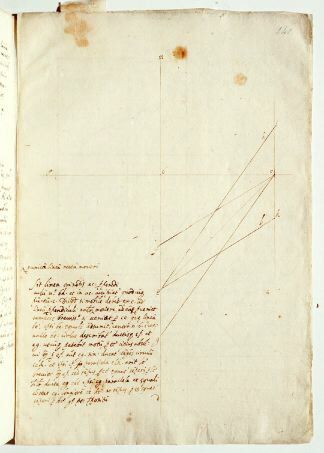 Written by Galileo; contains drawing, text. Relation to the Discorsi: elaboration of 2/30-th-19. 1 Sit linea orizontis ac, perpendiculum vero bd, et in ac accipiatur quodcumque punctum c. Dico, quod si mobile debet ex c ad lineam perpendiculi naturaliter per unicam lineam rectam moveri moveri [sic], ad eam perveniet tempore brevissimo si veniat per ce, quae lineam be, ipsi bc aequalem, adsumit. Centro enim b, intervallo be, circulus describatur, ductisque cf et cg utcumque, patebit, motum per ce citius absolvi quam per cf autem cg. Si enim ducatur tangens circulum ick, et ipsi cf parallela elk, erit le brevior quam cf: sed tempus per ce aequatur tempori per le. Similiter, ducta ehi ipsi cg parallela et aequali, constat cg longiorem esse he: at tempus per ce aequatur tempori per he. Ergo patet propositum.